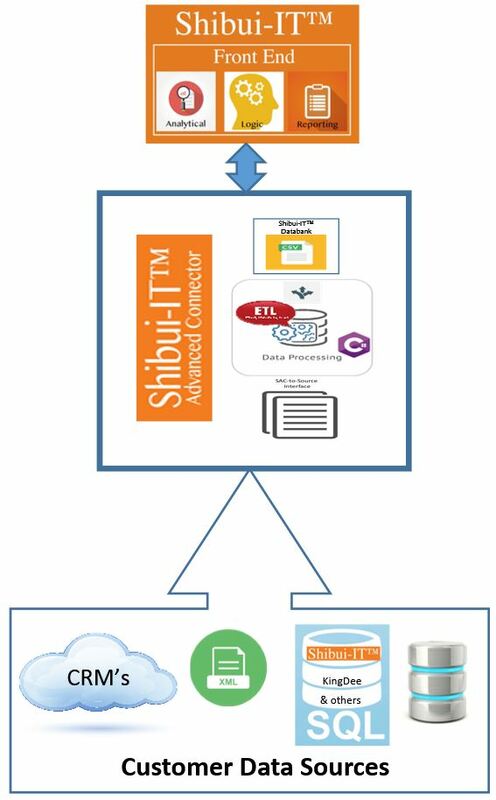 SAC is an Extraction-Transformation-Loading (ETL) tool which has been developed by kdm semi consulting GmbH (k•d•m) to load Enterprise Resource Planning (ERP) and Customer Relationship Management (CRM) data from multiple and different resources into the Shibui-IT™ databank. Transact-SQL logic is used to integrate this data into Shibui-IT™ Business Intelligence (BI) reports. The SAC architectural model consists of an (a) modularly extensible SAC to Source interface setting approach; (b) a SAC processing logic which uses a decision/logic-tree model and associated operations to support the target application requirements; and, (c) a configurable modular SAC CSV data repository. To support the SAC compliance diagnostic features, a data interpretation tool for debugging and monitoring of used customer data, or logging functions to report date of operations, are integrated.